Brendon Bussy is sometimes called a sound artist. But prefers the less threatening description ‘mandolin player’. Or even just the old fashioned ‘composer’. He enjoys exploring all aspects of sound – writing music, creating sound installations and performing. 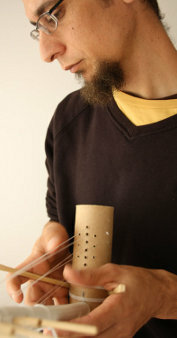 A fan of experimental electronic production, he also champions the use of cheap and available tools and materials, hence his recent forays into the design of DIY musical instruments using waste materials. As a mandolin player he performs using software (Audiomulch), electronics and recordings of the urban environment. But will happily write notes on paper for those who need it (one day there might even be a new string quartet). In short Brendon enjoys being useful whilst living in Cape Town, South Africa. Door 2011: Jori Snell’s production for Janet Buckland’s Ubom! theater group. Joyce’s Choices 2009: Eco-theatre production directed by Jacqueline Van Meygaarden. Rain 2007, New York: Soundtrack for Ralph Borland’s site specific installation Clinton Street. Edge of Wrong, Cape Town 2013: Directed and developed a performance ‘Normal Noise’ with four young deaf performers from the Dominican School for the Deaf (Wittebome). New Media Fest online 2007: Work “Tidal Pool” selected for this online festival curated by Julian Jonker. Signal and Noise Vancouver, Canada 2007: Electro – acoustic work “Track” performed. Unyazi (electronic festival) Johannesburg 2005: Live performance of “CMYK”, solo work for mandolin and electronics based on the artwork “Segue” created by SA artist Paul Edmunds. Incidental Amplifications Brisbane, Australia 2005: “Glassheater” (with Charles Maggs) played a shopping malls in Brisbane in celebration of Muzak. Sounding Out, Johannesburg 2012: Developed and exhibited Earshells (hearing contraptions). Jetty Square Sharks Cape Town 2005: designed wind activated ‘flute resonators’ for artist Ralph Borland’s life size sharks (permanent public installation). Dominican School for the Deaf (Wittebome) 2013 – 2014 (ongoing): Music and rhythm project with senior phase students. Focusing on rhythm skills and sign language song. Tales of an Unstable Nature 2005: Works for Solo mandolin and Audiomulch software. Self released. Diesel Geiger 2003: Electro – acoustic works featuring the Geiger Ensemble (violin, oboe, cello, mandolin, piano, and Audiomulch). Open Record. Ricky Gass, Rock ‘n Roll Cowboy 2000: Audio exploration of the life and music of Ricky Gass, a Durban based fringe music legend. Co – produced with Dean Henning. CORRECTIVE records. Award given by South African organisation NICRO, for establishing a photographic facility in Durban Westville Prison for juveniles awaiting trial.